There’s been a lot of talk in the news lately about putting cosmetics on farm animals. Naturally, this made me think of lead generation. No connection, you say? Consider this: Most lead generation campaigns are just internal strategy or positioning statements with some stock imagery added. These internal documents, meant to define a product or brand, were never intended to be used outside the company. But because lead generation is often considered the poor stepsister of brand or image advertising, the people in charge of it too often think of it as a throwaway or no-brainer. The result is a press release, strategy statement, or internal briefing document that’s been poured into a direct mail or email template—and it reads like it. All the benefits that have been deemed important are there, but they’re in a laundry list with no focused message. There’s no respect for the limited time of the audience—the fact that busy businesspeople need a simple, clear takeaway that can be digested with a short skim. In other words, the internal strategy statement is the pig. The pretty stock images, colors, and fonts are the lipstick. Take this email from XO Communications (editor’s note: contact information has been removed.) 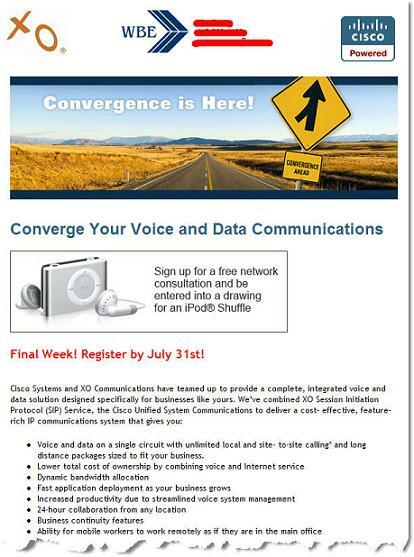 The headline says “Convergence is Here,” without any clear benefit. Presumably, the creators had discussed the benefit so much, it was obvious to them, only it’s not obvious to us, since we weren’t privy to their conference table discussions. Then, the bulleted list throws a lot of marketingspeak buzzwords around, but doesn’t make the benefits any more real, instead throwing out vague claims like “increased productivity.” Oh, and “business continuity features”—someday I’d sure like to know what they are! All internally approved benefit points, no doubt. Don’t cheat yourself of the response you’re after. Instead of putting lipstick on the pig, make sure your message is focused, simplified, and geared from the ground up for your audience. Only then will you have an engaging piece of direct response advertising. And that’s a totally different animal. This entry was posted in Copywriting, Creative, direct marketing, E-mail and tagged copy, Copywriting, Creative, E-mail, e-mail marketing on October 7, 2008 by Howard Sewell. I couldn’t agree more. Often the marketing skills universities include in their general degrees are based on business-to-consumer marketing. This is understandable because business-to-consumer skills apply more broadly, and the consumer market is the learning source for many of these skills. The challenge arises in a business-to-business environment when these skills are applied without changing the target audience from a paradigm of one to many, to one to one. While we are seeing a rapid convergence of business-to-business and business-to-consumer techniques, the requirement to use the best practices for business-to-business marketing remains. Dave, you’ve also brought *this* point home: Fundamentally there shouldn’t be any difference between internal documents and external ones. Call it an internal strategy statement, call it a press release, call it a direct email — will it or will it not be clear and compelling to those you want to read it and act on it? Is it going to do the job it’s supposed to do? I.e., even if this text didn’t leave the company…would *XO* get the “response” it’s after? Would employees outside the “conference room discussions” ‘get it’? Would it help them to sell XO? I’m skeptical.